Television is a popular technology that allows us to watch our favorite TV shows on screen. The television advertisement first broadcasted on 1st July, 1941 in New York. The advertisement was for Bulova Watch for 20 seconds. It was aired before a game of baseball played between the Philadelphia Phillies and the Brooklyn Dodgers. The cost of air buy during that time was only $9. In 2008, the cost of 30 seconds advertisement was $2.7 million in the Super Bowl broadcast. It is the world’s most costly airtime. NASA has announced that they have lost all of their original tapes of Apollo 11’s TV transmission in August, 2006. The Late Late Show of Ireland which started in 1962 and The Tonight Show which started in 1954 are the longest running talk show in the world. Sony began selling VCRs in 1970 that was capable of recording the television shows. However, Sony was sued by the film studios for copyright piracy. Later on, the Supreme Court backed Sony. Queen Elizabeth II has launched her own YouTube channel after fifty years when she first address for the Christmas to the public of UK. Nearly 36 percent mobile phone users can now watch the video beamed straight in their phones and the trend is still rising. Kids ages 6 and under spend as much time in front of a TV or computer screen as they do outside. The television is on an average of 7 hours 40 minutes a day in U.S. homes. The average American child sees about 200,000 acts of violence on TV by age 18. 92% of all U.S. households own a VCR or DVD player. On average, kids ages 6 to 11 watch 19 hours, 49 minutes of TV each week. The average American youth spends 1,023 hours each year watching TV and 900 hours in school. On average, girls ages 12 to 17 watch 19 hours, 49 minutes of TV each week. Boys watch 20 hours, 14 minutes. The average household has 2.4 TV sets. 98% of all U.S. households own at least one set. 79% have more than one TV set. 56% of children ages 8 to 16 have a TV in their bedroom; 36% of kids ages 6 and under do. 40% of Americans always or often watch television while eating dinner. American children spend an average of 4 hours 41 minutes a day in front of a video screen of some kind. 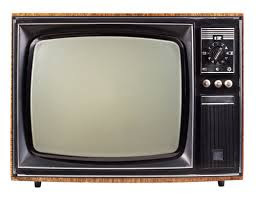 Early monitors used cathode ray tubes (CRT) but they have since been replaced by thinner screens that use liquid crystal display (LCD) and plasma. Similar to radio, television broadcasts are transmitted at specific frequencies. More recently there has been a change from analog transmissions to digital. The 0’s and 1’s of a digital transmission are like the information stored in a computer, making them more reliable than traditional analog broadcasts. Television broadcasts feature a wide range of programming, everything from news to sports, documentaries, sitcoms, reality TV, drama, movies and commercials. The most watched TV broadcasts are typically global events such as the Olympics and Football World Cup. Broadcasting companies use commercials and subscriptions to earn revenue and pay for the costs of production. In year 1926, J.L. Baird first displayed television which had only 30 lines and gave coarse image. Currently the digital signal of the television sends pictures with 1080 lines. A 103-inch plasma TV from Panasonic is the largest plasma TV currently available in the market, costing approximately around $70,000 .